The Meteva Accident, which happened on the 4th of May 2029, was one of greatest setbacks in biotech research of the twenty-first century. You all should be at least familiar with it, since it's still a part of the history program in schools everywhere. But there's some probability you weren't paying attention, so I'll give you a short reminder. Meteva-Girbach International, one of the pioneers in the biotechnology field, was forced to shut down their main research facility after a cyberterrorism attack. If this attack wouldn't happen, the biotech advancements (which right now are just entering their real world testing phases) would be widely available for the general public and we would be living healthier, longer and without the need to rely on the still clunky cybernetics. Fortunately the person responsible for the attack was caught and sentenced to a life in prison - which happened literally days before he could repeat his act against other corporations involved in cybernetics and biotechnology research, as he had planned. It is now April of 2059. 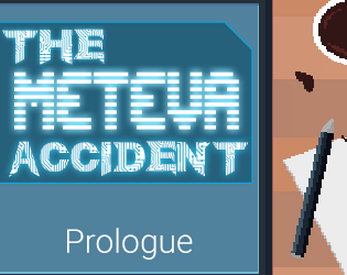 Follow Jake Sladek, a young and inexperienced journalist, as he gets voluntereed by his boss for writing a story about The Meteva Accident for it's 30th anniversary. The Meteva Adventure: Prologue is cyberpunk point and click adventure made for the #wagchallenge. Since the game jam restricts the gameplay length, I've decided to focus on making this a prologue to the rest of the story. This version of the game is fully developed in Unity by myself, that is Marcin Ruszkiewicz (@Saithir on Twitter). It's my first try at a full featured Unity game and also at making pixel art. Since the Unity Web Player is going out sometime soon, I've rebuilt the game for Win and MacOS standalone builds. Fixed a bug late in the game that kept two choices not to hide when they should. Disabled player being able to walk while talking to Aiden.